Your SEMrush Ads History Reports have a new look! The Keywords AdWords History report now has 3 new columns: Ads Traffic, Ads Traffic price, and Ads keywords (1). These metrics show data from the previous month. By default, domains for a given keyword are sorted by search engine positions in ascending order (2). The Domain AdWords History report has been also improved. When you generate the report, you’ll notice a new column: Coverage (3). This metric represents the percentage of ads displayed for a particular keyword during a specified period. 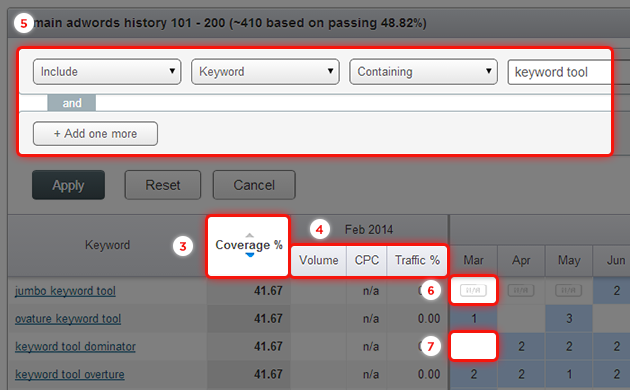 If a keyword was used for 12 months, coverage will be equal to 100%. We have also moved the Volume, CPC, Traffic columns (4) to the left side of the report’s table, which gives an instant understanding of keyword value for Ad copies. Also, we added new filters (5) to the Domain AdWords History report. You can include or exclude results by the specific keyword, Volume, CPC or Traffic. Data and filters are available via SEMrush API as well. Moreover, it is now easier to determine if a keyword wasn’t used for an ad for a certain month, or if SEMrush didn’t collect data. In both Domain and Keywords AdWords History Reports you will see the text N/A (6), if SEMrush didn’t collect data for a given month. A blank space (7) means that a keyword wasn’t used for an ad campaign. All new metrics are available via API as well! We hope our refreshed Ads History Reports will make your work easier! The Charts tool is making things easier! Check your website’s health with the SEMrush Site Audit tool!